Playlists are a Gold Membership feature that allows you to create a list of recordings to be played back to you continuously and without interruptions. Playlists are often used in contests and challenges to create a list of all the submitted recordings. Anyone can listen to a playlist, but only Gold members can create them. Playlists are created and recordings are added from the recording page. While viewing a recording you'd like to add to a Playlist click on the "Add Recording to Playlist" button. 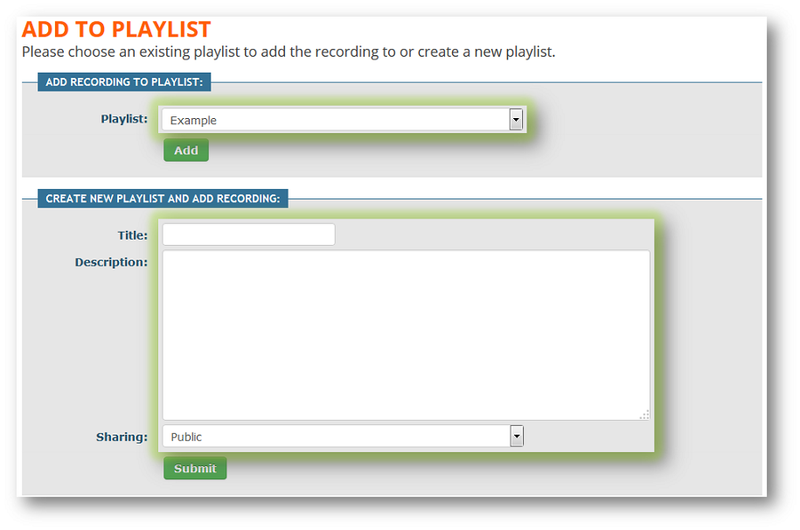 Next you'll choose to add the recording to an existing Playlist OR create a new Playlist for the recording. After adding a recording to a Playlist you'll be redirected back to the recording. 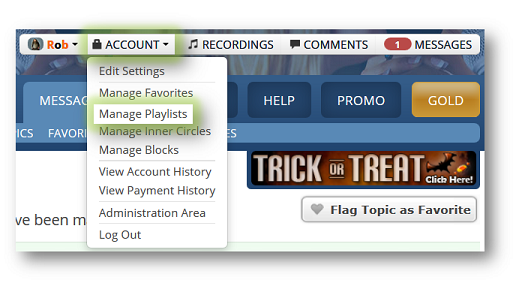 You can manage your Playlists by clicking on ACCOUNT in the navigation bar at the top of the site, then click on Manage Playlist. You can choose to Edit or Delete a Playlist. 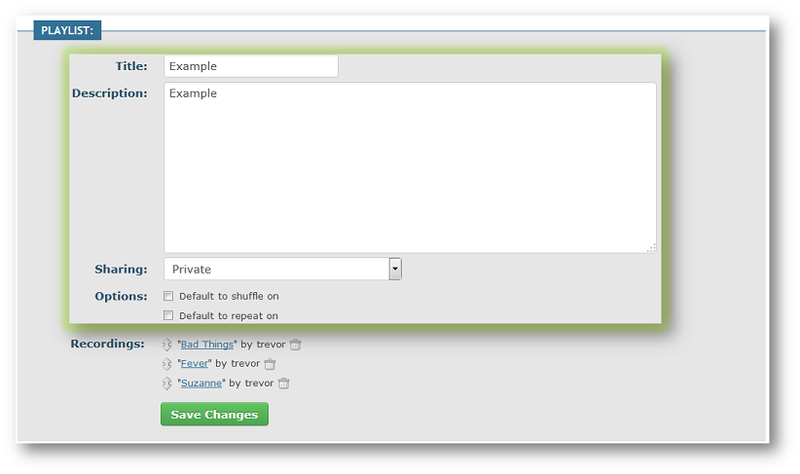 When editing a Playlist you'll be able to change the title, description, sharing option and default settings. You can also move recordings up or down to change their order by clicking and holding on the arrow button and dragging the recording to the desired position or delete a recording from the Playlist by clicking the trashcan icon for the recording. You can view public Playlists from the Watch & Listen --> Playlists page. If you want to have a spotlight area at the top of your Profile --> Recordings page here is how you'd create the playlist to add the spotlight. Open one of the recordings you'd like to add to the spotlight. Click the "Add Recording to Playlist" button. Create a new playlist titled "Spotlight" with a description of "Spotlight". It can be public or private. Add two more of your recordings to the Spotlight playlist. That's It! You'll now see a spotlight of those three recordings. If you want to change a recording in the spotlight add a new recording to the Spotlight playlist and then remove one of the old ones.